Last month, I flew from Los Angeles to Hong Kong on one of those sleek jets that fuse heaven and earth, a Boeing 777. The livery was painted in the green and white colors of Cathay Pacific, the Hong Kong-based airliner whose name combines the ancient word for China with the world’s largest ocean. We took off an hour before midnight from Los Angeles with the artificially illuminated desert spilling into the black waves beneath us. Bound for Asia, the plane began heading northwest. I flicked through the options on the in-flight entertainment system and came across a television show I’d been meaning to watch: AMC’s The Terror. Released earlier this year, the ten-episode show recounts the harrowing tale of the two British Royal Navy vessels that disappeared during an Arctic expedition from 1845-1846. Like many European efforts for four centuries prior, the motivation for the Franklin expedition, named after its captain, Sir John Franklin, was to find a shortcut to Cathay. Nearly four hundred years of European-led explorations across North America had demonstrated that there was no northwest passage across the more navigable, temperate latitudes of the North American continent. These expeditions had, however, done a great deal of mapping of the Atlantic and Pacific coasts of North America. Some in England believed that just one more voyage was needed to map a route that would connect the two sides. An English map below of northern Canada from 1843 shows how tantalizingly close the British were to charting the Northwest Passage and finding a watery way to Asia. Franklin’s expedition aimed to go around the top of Canada in order to reach the riches of the Orient on the other end. The ships, which had already proven themselves during Antarctic expeditions, were in some ways nineteenth-century equivalents of the Boeing 777, only with more books. Steam engines repurposed from railway trains propelled the ships at speeds of up to four knots (while impressive for their era, the engines on modern commercial motorboats are likely more powerful) and 1,200 volumes of reading material lined the shelves of each ship. Despite all the pomp, circumstance, and technology, the efforts of the 129 men on board Erebus and Terror would, of course, be in vain. Representing the largest single loss of life in any one polar expedition, every single crew member perished. Yet the details of how or why the expedition failed have remained shrouded in mystery. Until the ships were finally located underwater in 2014 and 2016, oral histories from the Netsilik Inuit, who live in present-day Nunavut, about the qallunaat, or “white man’s boat,” were one of the main sources of knowledge about the ill-fated expedition. Ironically, although the Netsilik Inuit were one of the last Northern Indigenous peoples to come into contact with Christian missionaries from the south, they were likely the first to come across the ghostly remains of Erebus and Terror. It is their stories, combined with sonar technology, that enabled a team of Canadian researchers to finally find the well-preserved remains of the ships just a few years ago. On my flight to Hong Kong in my relatively comfortable aisle seat, I began watching one episode of the polar television show after another. As the hours ticked by, sailors dropped like flies. The summer of 1845 turned to winter, which the sailors spent on Beechey Island at the eastern end of Canada’s Northwest Passage. Three men died of tuberculosis and were buried here. The following spring and summer, as the ice thawed, the ships pushed on a little bit farther, coming to rest some 450 miles south near King William Island, which was familiar territory to the Netsilik Inuit. But on September 12, 1846, the ships became locked into ice that never defrosted – a scenario nearly unimaginable now in the overheated Anthropocene. As the months and years dragged by, with the return of the sun doing little to moderate their surroundings, it appeared that the only option available to the sailors was to abandon ship by walking. After a long period of deliberation painfully captured in the AMC series, on April 26, 1848, the 105 men still living set out on foot, dragging provisions (including, according to Inuit oral history included in a recent scientific paper, “paddles, table knives, a watch, telescope, tobacco, dishes, books, and papers” and a crucial 70 kilograms of chocolate) in small boats on sledges. Their material legacy lived on, however, in strange and unpredictable ways, as an enthralling New York Times article details. The great-great grandfather of Louie Kamookak, a local historian who was part of the team that helped locate the sunken ships, possessed a knife from the Franklin expedition that he turned into an ice chisel. Back up in the air on the Cathay Pacific flight as we hovered somewhere over Alaska, announcements from the flight deck occasionally interrupted the Royal Navy sailors who were trading salty barbs on the twelve-inch monitor in front of me. In Australian-accented English, the Cathay pilot apologized for the turbulence. Turbulence! To think that this is one of the worst things people fear now when skipping across the planet. Sailors on board Erebus and Terror had to contend with heaving seas, invisible icebergs, and bone-chilling temperatures. If the rumors of cannibalism during the torturous overland slog are true, the sailors even had each other to fear. The tragedy is that in they spent more time fearing and disdaining the Inuit, whom the show takes pains to depict as knowledgeable and only wanting to help rather than harm the crew members they ostensibly encountered. Watching the Terror from the aisle seat on a Cathay Pacific flight from Los Angeles to Hong Kong. On Cathay Pacific, economy-class passengers might complain about the narrow seats, lines for the bathroom, and poor quality food. Yet being served two hot meals within 15 hours – no matter how oversalted or overcooked – is a luxury compared to the monotonous rations accorded to the sailors (who had to bring their own cutlery!) on-board Erebus and Terror. According to the manifest, over 64,000 pounds combined of salt beef and salt pork, 1,008 pounds of raisins, and 1,350 pounds of stodgy porridge met the bulk of caloric needs. Some dietary variety came from the approximately 8,000 cans of food stored (perhaps akin to the small bags of potato chips, peanuts, and granola bars laid out in the back galley of a Cathay Pacific flight). At the expedition’s outset, a few live cows were even brought onto the ships (something to which perhaps only Soviet-era Aeroflot could hold a candle, with apocryphal stories of chickens and other livestock roaming the aisles mid-flight). Ten muskox from Greenland were also slaughtered right before the ships departed from a stop in Disko Bay. Rather than being sumptuously stewed in a Thai red curry, which happens in some restaurants in Greenland today, as I’ve written, the shaggy beasts’ meat was probably overcooked according to the time-tested practices of British cuisine. Of course, everything’s relative: according to this richly detailed blog post by David Victim on British Navy diets, one admiral wrote that English sailors “are so besotted on their Beef and Pork, as they had rather adventure on all the Calentures, and Scarbots in the World, than to be weaned from their Customary Diet.” I don’t think anyone would venture to admit to such feelings about in-flight transpolar meal service. Passengers would also certainly be losing their tempers on Twitter if they were expected to carry forks and knives with them. Erebus and Terror planned to explore the waters north of Canada for three years and brought provisions to last for five. Now, passengers can fly seamlessly between North America and Asia in less than a day, crossing above the same Arctic waters that proved so perilous to the Franklin expedition. In July 1998, Cathay Pacific became the first airliner to fly a non-stop transpolar flight across the North Pole. Flight CX889 took off from New York City and touched down in Hong Kong after a mere 15 hours and 35 minutes. 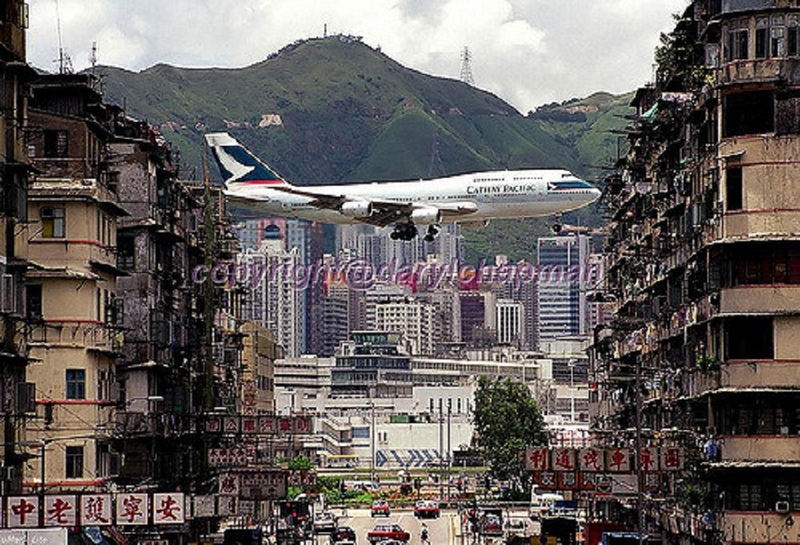 As if the inaugural transpolar voyage wasn’t enough of a landmark, the flight also marked the first time a flight landed at Hong Kong’s Chek Lap Kok Airport, the international airport opened in 1998 to replace the older Kai Tak airport nestled deep within the bowels of Kowloon, one of the most densely populated places on Earth. If the great circle drawn between New York and Hong Kong, as the map below shows, is close to the actual flight path taken then and now between the two cities, then it would cross directly over the fateful route taken by Erebus and Terror – and come very close to the final resting places of the two ships and their crew members. The ships never made it to the so-called Pearl of the Orient, but British pubs like the Sir John Franklin are a dime a dozen in certain quarters of the former colony. Cathay Pacific was started by an American and Australian, and their pilots are still largely from Britain and other Commonwealth countries like Australia, New Zealand, and Canada. Franklin himself circumnavigated Australia in 1802-1803, and two other crew members had close relatives who had explored Australia on behalf of the British Empire. In watching The Terror from the confines of my seat 30,000 feet above the Pacific Ocean – the very waters the crews of Erebus and Terror so desperately sought to find – I couldn’t help but see this flight as a continuation of that doomed voyage that had started out from Greenhithe a century and a half ago. Cathay Pacific’s flight and all of the other transpolar flights that have followed in the two decades since represent the closure to a chapter in the quest for a shortcut between North America and Asia. Although ships still do not regularly sail the Northwest Passage between the two continents – only two vessels transited the entire route this year, while the Crystal Cruises trip along the same route has been indefinitely put on hold – hundreds of flights fly north of the Arctic Circle to connect North American and Asian cities each month. Despite setbacks and tragedies, polar exploration continues, and it has now moved to the skies. Anyone interested in the Franklin expedition should make a point of seeing the stunning exhibition currently at Mystic Seaport Museum in Mystic, CT, USA. Death in the Ice: The Mystery of the Franklin Expedition. It shares the entire story, including artifacts from the failed voyage and objects recovered from TERROR and EREBUS. Thanks for your comment and the information about the Franklin Expedition exhibit at Mystic Seaport. I would love to see it myself if I have the chance! I see it runs until late April, so hopefully I can make it to New England at some point before then.